German Federal Ministry for Economic Affairs and Energy (BMWi). 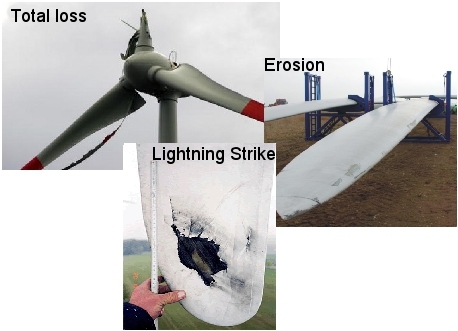 When operating a wind turbine, damage of the rotor blade is a serious problem and has to be taken into account. The rotor blades are subjected to varying dynamic loads during the whole lifespan which is planned to be at least 20 years. The production processes of modern blades is lowly automated with higher fabrication tolerances. Even small damages of the blade can accumulate over time and lead to structural relevant damage. Therefore regular sight inspections are mandatory in many countries. However these inspections cannot provide an instant damage detection. Besides the safety risk of an undetected damage, the economical burdens are increasing rapidly if the damage increases given the costs of repairing, replacing and downtime. A system detecting reliably defects and in early stages helps to react fast and to avoid greater damage. Such a method will enable the wind turbine operator to provide higher operational safety and to minimize the economical burdens. The aim is to pave the way to a rotor blade damage detection system which reliably detects damage in early stages. A further goal is to extract useful information about the damage like its location and an estimate of the damage relevance. One promising approach for early rotor blade damage detection is the acoustic emission event detection method. In this regard acoustic emission events are stress waves emitted by a damage process. While other acoustic emission approaches use measurements of ultrasonic sound waves at the surface of the material with many sensors, we propose using the airborne sound in audible frequencies and only about three sensors. The higher risks of lightning strike damage with wired electrical sensors is avoided by using fiber optic microphones. Recording of a full-scale rotor blade test till failure were made as well as recordings in an operating wind turbine. With a sophisticated signal processing environmental noise is handled, making the approach robust for operating under real world conditions. Acoustic Emission Localization Using Airborne Sound: Where Did the Wind Turbine Rotor Blade Crack?